A video too is doing rounds on social media which has the stars waiting at the airport to check-in for their flight. Top actors of Tollywood Ram Charan and Jr NTR will be teaming up for the first time which will be one of the biggest multi-starrers in South Indian cinema. The film will be directed by SS Rajamouli and will be have sports as the backdrop. The news about the multi-starrer came out in the form of a picture of SS Rajamouli with Ram Charan and Jr NTR which was posted on social media right after the release of Jr NTR’s Jai Lava Kusa, much to the joy of fans of Telugu cinema. The film is yet to be titled and is the most anticipated for film in Tollywood now. And while the pre-production works are going on for the film, actors Ram Charan and Jr NTR were spotted at the airport leaving to the US for their preparations for the multi-starrer. Snapped by a fan who was standing nearby, the picture is going viral on social media and created huge buzz around the film. A video too is doing rounds on social media which has the stars waiting at the airport to check-in for their flight. 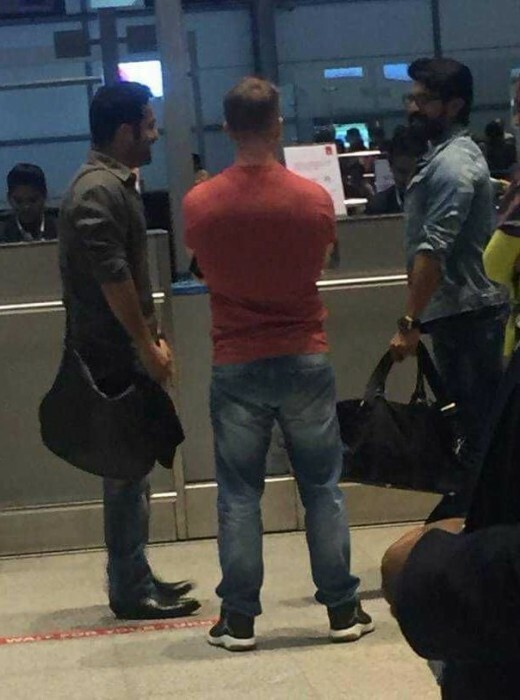 Jr.NTR and Ram Charan spotted at an airport. On their way to do test footage and photoshoot for SS Rajamouli next movie. This yet to be titled film will have very less VFX works and will bank more on storytelling. Reports reveal that Vijayendra Prasad, Rajamouli’s father, is currently working on the script and soon the pre-production work will begin for the film. Not much details were revealed by the makers except for the lead actors which has already created huge excitement around the film. According to latest reports, director Rajamouli has decided to rope in another top actor in Telugu as the antagonist in the film. However, it is not yet confirmed who that actor will be and what kind of role that would be. If reports are to be believed, Rajamouli doesn’t want to compromise on the cast of the film and wants powerful actors in the lead roles. Awesome! A huge step towards more multi-starrer movies! cannot wait to watch it.